It was reported with great sadness yesterday that two of the 16 hen harrier chicks that fledged in England this year have gone missing. The satellite tags fitted to them in the Forest of Bowland have stopped transmitting. These transmitters, the same as those used by the GWCT on woodcock, can fail but it is highly unusual. On rare occasions they can suddenly start transmitting again but from our experience that tends to be after a bird has been sitting on a nest and the bird moves back into sunlight and the battery is able to recharge. Every hen harrier chick matters. As Bob Elliot, RSPB Head of Investigations, pointed out the loss of signal from these two birds (three days apart) suggest either natural predation or human intervention as the likely cause. Either way, it is desperately sad news. Chris Packham has highlighted technology is on our side and we need to keep watching. The English hen harrier population is too low. The species needs its own action plan and Defra has committed to producing one. Let's hope it gets published soon so it can be properly debated and hopefully implemented at the earliest opportunity. I am GWCT member and grouse shooter ( occasional) . last week in Scotland we were all lined out and a hen harrier crossed the butts and covered the moor in front of the guns prior to the drive. the drive was a blank but everyone marvelled at this incredible bird ( we were not all posh southerners!). maybe that isn't the vision you want to publicise? as you know there is a way forward to maintain a balance between the huge benefits of grouse moor management for many wild species and hen harriers but you prefer conflict and no resolution. advocate the publishing of the Langholm report and please lets move forward? I wish Mark Avery et al would stop this rant of "RSPB good, GWCT bad." I have an interest in country sports and wildlife generally, and subscribe to the view that DEFRA needs to bring their Harrier plan to fruition asap - and this will require all parties to work together to ensure sucess. At a local agricultural show recently I dropped in to the RSPB stand which was heavily featuring the Hen Harrier plight. I had a long conversation with the RSPB people wherein we found much common ground, which was encouraging. And when will Avery and gang stop making unfounded assertions that "grouse shooters illegally kill Harriers?" If he has evidence, make it public, otherwise stop mud-slinging. Shooting is Green as it must be sustainable. Go beyond the critical limit and there will quickly be nothing left to shoot. So improving habitat for wildlife is really enlightened self-interest, shooting can only continue if quarry species are conserved and this involves creating and maintaining the right habitat for your quarry. But this benefits other wildlife, as they too need places to shelter, feed and breed. For instance, moorland managed for shooting typically supports 33 different species of birds compared with 15 on unmanaged moorland. On average the man with a gun is a better custodian of wildlife than the man with a pair of binoculars. Consider the Langholm project: Between 1992 and 1997, hen harrier numbers rose from 2 to 20 pairs in 6 years on a driven grouse moor. Shooting was abandoned because the hen harriers ate over a third of all grouse chicks that hatched. With no grouse shooting, the local culture, economy and employment suffered and the control of generalist predators ceased. By 2003, 20 harrier nests were back down to 2 and numbers of breeding grouse and waders had more than halved. Shooting and conservation are bedfellows. Consider The Glenwherry Project: The red grouse, one of Northern Ireland's rarest game birds, has been saved from dying out in a remote upland area of County Antrim. Down to just six pairs, a grouse regeneration project at the Department of Agriculture's Glenwherry farm has involved culling hundreds of foxes and crows, as well as regenerating the heather grazing. Shooting & conservation increased grouse numbers from 6 pairs to 180, a 2900% increase, a statistic that The League Against Cruel Sports chooses to ignore. Consider The British Trust for Orni-thology survey that shows that there are four times as many merlins on grouse moors as on unkeepered upland ground. 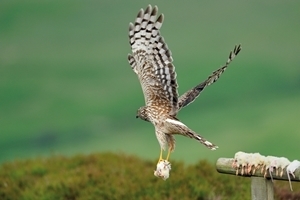 Hen harriers have not benefited from upland management for grouse whether in England or Scotland. Studies about the comparative breeding success of hen harriers on and away from grouse moors in Scotland show that. And we know the dire situation of the hen harrier in England. There are a range of factors that will affect breeding success, including natural predation but unfortunately, human persecution is the major one that restricts their success. It is far too simplistic to lay the blame for restrictions in the range of hen harriers on the fox. If that was the case, grouse moors would be havens for harriers but the opposite is true. Hen harrier clutch survival and productivity should be higher when a moor is keepered but the fact is they are not. Why? Why is clutch survival and productivity higher on unkeepered moors where they are exposed to the fox? Grouse moors use predator control to produce unnaturally high numbers of grouse necessary for driven shooting. A by-product is increased numbers of waders which is welcome. Conservation bodies sometimes use fox and crow control as a last resort to protect vulnerable species in particular locations in order to secure a sustainable population but always with the objective of securing a bio-diversity that includes predators including birds of prey. Neither of these facts is justification for claims that predator numbers are out of control, that predator control is the prime factor in restoring wader or other bird populations or that management of land for wildlife is best done through management for game shooting. The latter, if done properly and in partnership with conservation organisations – and it does happen – can be positive. Simply comparing numbers of waders or other particular species (those lucky enough not to pose a threat to grouse) is not the point. All other things being equal, we would expect fewer birds in a landscape where predators are part of the picture than one where every threat to a grouse is removed to maintain their high numbers. GWCT is using good science with careful outcome measurement to contribute to well evidenced best practice in wildlife conservation and steering countryside people, including the shooting community, to use it. To tar farmers, landowners, the shooting community, and the best of our conservation NGOs with the same brush as alleged killers of hen Harriers, makes Mark Amery and institution he has represented look ridiculous - as well as belittling Britain's conservation movement in general. Mark certainly has not tarred all with the same brush, had you taken the time to attend Hen Harrier day you would have heard a very balanced point of view from both himself and Chris Packham, the point being made is that there are more than a few bad apples in the shooting community, possibly a growing number as with the loss of 2 hen harriers in the past few weeks. If the estates in question cannot manage the land within the law, then a ban is by far the best solution to the problem in the short term, followed by education and retraining and then closely monitored licencing as a way back. Laws are made to be abided and some people are thinking that they are above the law - it needs to be stopped with a firm hand. We left the Victorian era long ago, you need to catch up. Listen to Mr Avery and draw your own conclusion. Click play arrow at top of page.